AUTHORIZED DEALER! BRAND NEW IN BOX! FAST SHIPPING!!! 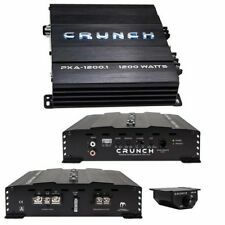 Crunch PD1500.1 Pro Power 1500 Watt Class AB Mono Subwoofer Car Amplifier. Item Code: PD1500.1. This Pro Power model features built-in electronic crossovers and high-level inputs. 1500 Watt Mono Subwoofer Car Audio Amplifier. Remote bass knob. Bass EQ @45Hz: 0-9dB. Variable Low Pass: 40Hz-150Hz. Power Output @ 4 Ohms: 1 x 900W. On board digital processing. The engineers at Crunch aim to make every system the best it can be. The Class A/B mono amplifiers are 1-Ohm stable and the 2 and 4 channel amplifiers are 2-Ohm stable. Silver preamp-level RCA inputs. Remote bass knob. Bass EQ @45Hz: 0-9dB. Variable Low Pass: 40Hz-150Hz. Power Output @ 4 Ohms: 1 x 600W. On board digital processing. 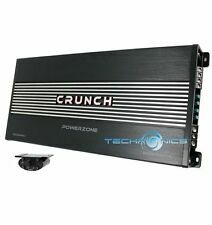 Crunch PD2100.1 Pro Power 2100 Watt Class AB Mono Car Subwoofer Amplifier. Item Code: PD2100.1. This Pro Power model features built-in electronic crossovers and high-level inputs. 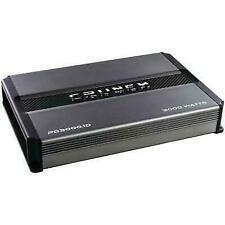 2100 Watt Mono Subwoofer Car Audio Amplifier. The engineers at Crunch aim to make every system the best it can be. The Class AB monoblock amplifiers are 1ohm stable. Amp protection has system-diagnostics LEDs that indicate current/amp overload, short circuits, thermal overload and DC offset. Model: PX2000.1D. Class-D 1-Ohm Stable Monoblock Amplifier. Signal Processors/ Equalizer. Amplifier Type Amplifier Features 3-way protection circuitry (thermal, overload, and speaker short protection). 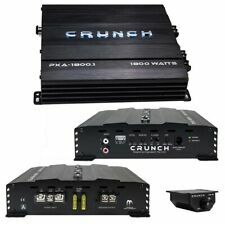 Crunch PD3000.1D Pro Power 3000 Watt Class D Mono Subwoofer Car Amplifier. Item Code: PD3000.1D. This Pro Power model features built-in electronic crossovers and high-level inputs. 3000 Watt Mono Subwoofer Car Audio Amplifier. Class AB monoblock. QTD (Quick Thermal Dispersion) technology heat sink. Onboard bass boost. 1,500W max. We focus on making purchasing online a pleasant experience. Our sales office is located in beautiful town of Redondo Beach, California, just a few miles South of Los Angeles International Airport. Illuminated Crunch badge. Variable Low-Pass Filter (40-150 Hz, mono 24 dB/octave). Unbalanced input (RCA Jack). Input sensitivity Soft start sound. Full range line output. Put the completed RMA FORM inside the box with your item. Product SKU: 112251 ID: px20001d. Class-D 1-Ohm Stable Monoblock Amplifier. Crunch PX2000.1D. Crunch Power X Series PX2000.1D. 6 phase alternators use less horsepower per Kilowatt than conventional 3 phase alternators. 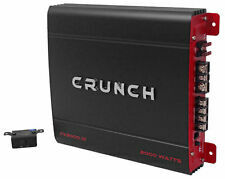 NEW,CRUNCH PD3000.1D 3000 Watts. MONO BLOCK POWER DRIVE SERIES CAR AMPLIFIER- for Sale. 20 00W Monoblock Amplifier. This amplifier is designed for those with serious performance in mind. Also works great in Marine and ATV applications when not exposed to direct water. REMOTE BASS KNOB. 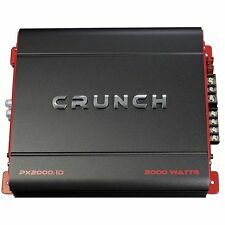 Crunch PX20001D 2000W Monoblock Power X Series. Features include built-in electronic crossovers and high-level inputs. 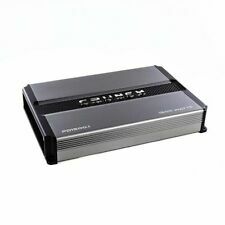 Crunch POWERX 2000 watt mono subwoofer car audio amplifier. Variable Electronic 12dB Per Octave. CRUNCH POWER DRIVE PD30001 3000 WATT MONOBLOCK AMPLIFIER. Exclusive Crunch SPEED-FET MOSFET components maximize power efficiency while improving sound quality and minimizing distortion. LED System Protection Circuitry - Monitor overload and speaker short protection with lighted indicators on the amplifier end panel. Trending at $128.53eBay determines this price through a machine learned model of the product's sale prices within the last 90 days. 3000W Max Power Drive Series 1-Ohm Stable Monoblock Amplifier. Class-A/B 1-Ohm Stable Monoblock Amplifier. Crunch PD 3000.1. Crunch Power Drive PD 3000.1. 3-way protection circuitry (thermal, overload, and speaker short protection). Crunch Power Drive Mono 3000w Amplifier. POWERX Amp (Monoblock Class D. Amplifier Class. Amplifier Application Car Audio. 2000.00 WATT. 2,000W max. 2,000 Watts max). Input Type. Battery Information Product does not require a battery. 1500W Monoblock Amplifier. This amplifier is designed for those with serious performance in mind. Also works great in Marine and ATV applications when not exposed to direct water. SEPP (Single Ended Push Pull) A/B Class Amplifier Designs. PD30001 Crunch Power Drive. 3000 Watt Monoblock Class D Amplifier With Remote. With Crunch PD, you will have an amplifier that makes big power and runs very cool plus it sounds like you would expect your music to sound. CRUNCH PX SERIES PX2000.1D 2000 WATT MONOBLOCK AMPLIFIER. 1000 WATTS X 1 @ 2 OHMS. Variable low pass and subsonic filters. Amp Protection with System Diagnostics LED's to Protect Against:Current / Amperage Overload, Short Circuits, Thermal Overload,DC Offset. CRUNCH POWER DRIVE PD2100.1 2100 WATT MONOBLOCK AMPLIFIER. QTD (Quick Thermal Dispersion) technology heat sink. Mono subwoofer amp. Onboard bass boost. Class AB monoblock. Built-in variable electronic crossover (LP). Crunch Power Drive Class A/B Mono 2100w Amplifier PD21001. Crunch Power Drive Class AB Monoblock (Mono, 1-Channel) 2100 Watts Car Audio MOSFET Amplifier PD21001. SKU: PD21001. Exclusive Crunch SPEED-FET MOSFET components maximize power efficiency while improving sound quality and minimizing distortion. The Crunch POWER DRIVE Monoblock Class AB Amp (1,500 Watts max) is unlike any Crunch amplifier. The first thing you'll notice is the size. This amp is big. Class AB monoblock. POWER DRIVE Monoblock Class AB Amp (1,500 Watts max). Put the completed RMA FORM inside the box with your item. Alaska, Puerto Rico, Hawaii, Residents. All International Residents. APO/FPO, Virgin Islands, Guam and All Other U.S. Territories. Crunch PD1500.1 (PD 1500.1). Crunch Power Drive PD 1500.1. 1500W Max Power Drive Series 2-Ohm Stable Monoblock Amplifier. Class-A/B 2-Ohm Stable Monoblock Amplifier. 6 phase alternators use less horsepower per Kilowatt than conventional 3 phase alternators. 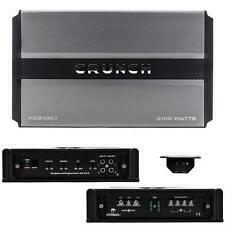 CRUNCH PZX1000.1 POWERZONE Monoblock Class AB Amp (1,000 Watts). You may also be interested in. 20 00W Monoblock Amplifier. This amplifier is designed for those with serious performance in mind. Also works great in Marine and ATV applications when not exposed to direct water. SEPP (Single Ended Push Pull) A/B Class Amplifier Designs. This amplifier is designed for those with serious performance in mind. Also works great in Marine and ATV applications when not exposed to direct water. LED System Protection Circuitry - Monitor overload and speaker short protection with lighted indicators on the amplifier end panel. Crunch PX2000.1D 2000W X Series Class D Monoblock Subwoofer Amplifier . PX2000.1D: 2000W X Series Class D Monoblock Subwoofer Amplifier. EQUALIZER Electronic PRE-AMP CIRCUITRY Low Noise PreAmplifier. This class D amplifier boasts 3000 watts of max power with 1500 watts at 2 ohms, as well as 12 dB electronic crossovers, high level inputs that tie into OEM audio systems, and low noise circuitry. Use the included remote to crank your bass to your heart's content. Crunch - PX 2000.1D. Details about Enrock Marine Single-DIN Car Boat Radio Dash Kit Protectors (Black / White). Refurbished Dept (12). Outdoor Electronics Sale (10). Details about Enrock Audio Marine Grade Antenna, Various Size and Applications. 1000 WATTS X 1 @ 2 OHMS. Variable low pass and subsonic filters. Daisy-Chain Line Outputs. Amp Protection with System Diagnostics LED's to Protect Against:Current / Amperage Overload, Short Circuits, Thermal Overload,DC Offset. CRUNCH POWER DRIVE PD1500.1 1500 WATT MONOBLOCK AMPLIFIER. QTD (Quick Thermal Dispersion) technology heat sink. Mono subwoofer amp. Onboard bass boost. Class AB monoblock. Built-in variable electronic crossover (LP). Exclusive Crunch SPEED-FET MOSFET components maximize power efficiency while improving sound quality and minimizing distortion. LED System Protection Circuitry - Monitor overload and speaker short protection with lighted indicators on the amplifier end panel. Remote bass knob. Bass EQ @45Hz: 0-9dB. Variable Low Pass: 40Hz-150Hz. High Level inputs for easy OEM integration. Power Output @ 4 Ohms: 1 x 900W. 2100W Max Power Drive Series 2-Ohm Stable Monoblock Amplifier. Class-A/B 2-Ohm Stable Monoblock Amplifier. Crunch PD 2100.1. Crunch Power Drive PD 2100.1. 2 ohms: 2100 watts x 1 chan. Total power output: 2100 watts. Class D monoblock. QTD (Quick Thermal Dispersion) yechnology heat sink. Onboard bass boost. We focus on making purchasing online a pleasant experience. Our sales office is located in beautiful town of Redondo Beach, California, just a few miles South of Los Angeles International Airport. NEW 1500w Monoblock Car Subwoofer Amplifier.Power Speakers subs Amp.2Ohm.Bass.